So says faux-Democrat Cory Booker in his love letter to the reformers who put him where he is today. Sure, let's not abolish tenure. Let's simply make it meaningless. The Wal-Mart family did not finance Booker so as to help working people. Wal-Mart money subverts public schools because union is a scourge that must be stopped, so that people can do as they're told, shut the hell up, and work until they die. Booker hits all the same tired points "reformers" hit every morning instead of the national anthem, including the nonsensical claim teachers get lifetime jobs, and that we need to add merit pay. This, of course, is trotted out despite very recent evidence that it doesn't work. Predictably, Booker goes into the same old nonsense about bad teachers. They are a plague, apparently, and the only way to get rid of them is to worsen working conditions for all teachers. Teachers, says Wal-Mart's favorite mayor, must be compensated based on "effectiveness." Now what the hell that is, Booker doesn't say. Does it mean they get higher test scores? Does it mean they're cute and perky? I'll tell you precisely what it means. 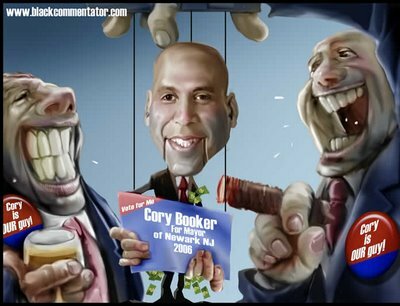 An effective teacher, to disingenuous corporate puppets like Cory Booker, is an at-will employee. Booker rubs shoulders with Democrats and appears, for all intents and purposes, to be a reasonable guy. But he speaks well of anti-teacher Chris Christie and crooked Chris Cerf, because in whatever remains of his heart, he's no different from them or indeed, Wisconsin Governor Scott Walker. They all represent the same interests. Perhaps Booker takes another approach, not wishing to appear so radical. But make no mistake, like Christie, like Walker, he'll happily roll back the twentieth century so if you don't come in Sunday you won't bother coming in Monday.